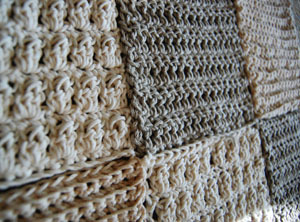 The 2010 Flamie Awards from the Crochet Liberation Front are being voted on right now!! Be sure to vote. Several of your/my favorite designers, sites, etc are up for awards. Crochet Luminaries like Rita Weiss, Jean Leinhauser, Kim Guzman, Pauline Turner, Prudence Mapstone, Doris Chan, and many others are waiting in their categories for your vote. Only takes a few minutes. Only takes a few minutes to cast your votes. Our crochet faves deserve our votes! NOTE: The pic above has NOTHING to do with voting. It’s the LionBrand crochet sampler afghan. I just like the picture!